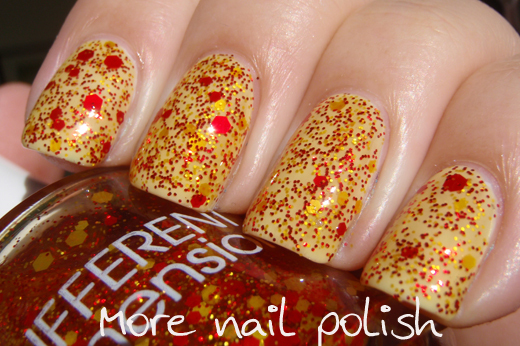 Today I have four polishes from indie brand Different Dimension. Bazinga - from 'The Big Bang Theory Collection'. 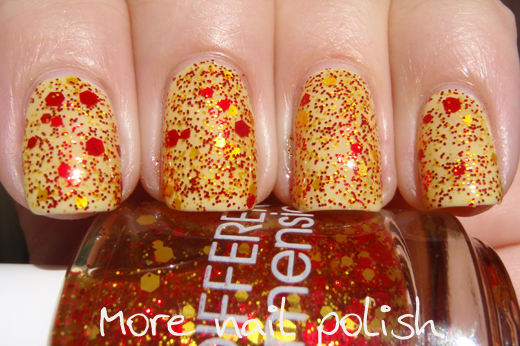 The polish has different sized red and yellow hexes in a yellow jelly base. I really wanted to show off the yellow jelly base of this polish, so I chose to layer two coats of Bazinga over a coat of white. I love that the yellow jelly base was so smooth an even. 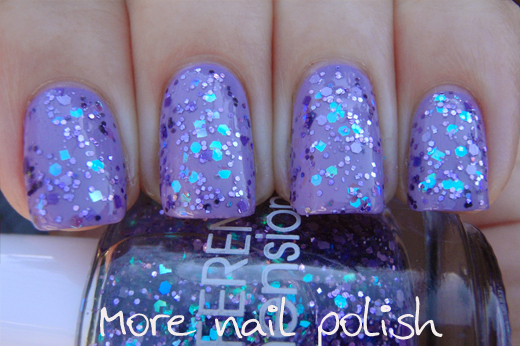 Sparkles like Edward - I have to admit, I'm not really a fan of the polish name, but the actual polish, that's a totally different story. 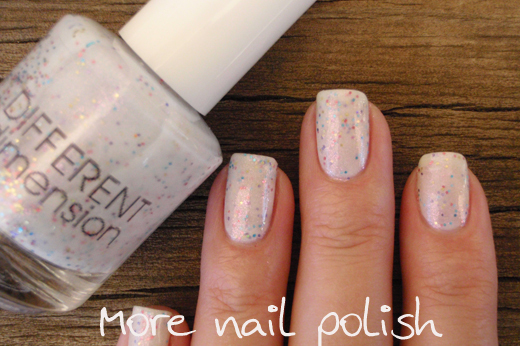 This is so pretty, and so different to a whole bunch of other multi coloured glitters in a white base. 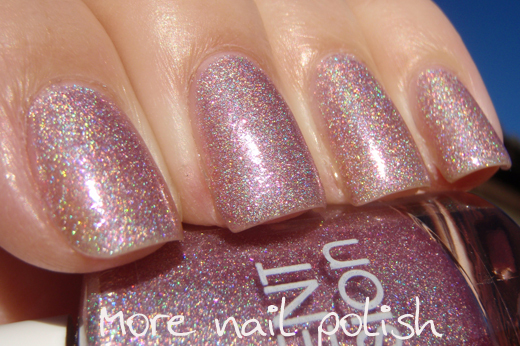 The white base has duochrome shimmer that goes from pink to gold and all the multicoloured glitters are also holo. 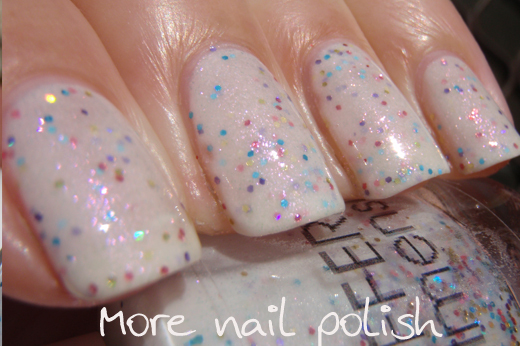 This was three coats of Sparkles like Edward on it's own with Seche Vite Top coat. That is so fetch - from the 'Mean Girls Collection'. 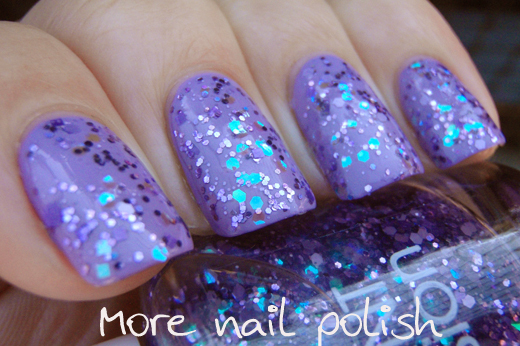 This polish has several different sizes of matte purple hexes and squares, ultrafine purple holographic as well has color shifting blue iridescent glitter. I've layers two coats over purple (which I can't remember which it was - sorry.) The bright blue glitters really stand out over a darker base. Wide Awake - from the 'Set it Free Collection'. Light pink scattered holographic polish with some light pink glass flecks. Three thin coats on its own. So much prettier in real life than these photos show. 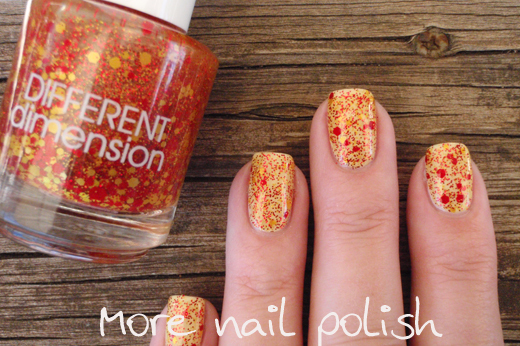 This was my first experience with Different Dimension nail polish and I really like the mix of different finishes. 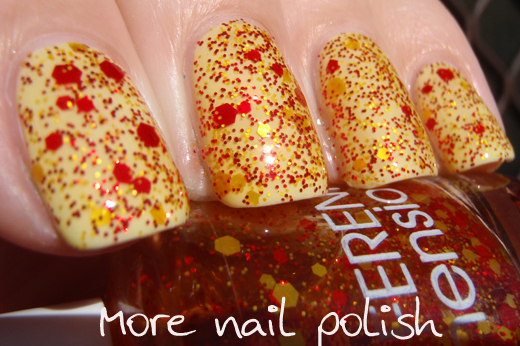 All the polishes applied well and were a good formula, although That is so Fetch was a little thicker than the others. 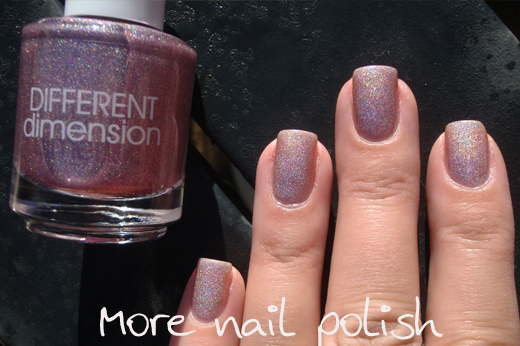 Different Dimension polishes are available from Llarowe and the Different Dimension Etsy Store. You know I still can't quite believe the explosion in indie nail polish brands over the last two years. It's completely amazing to think how many hundreds of new brands there are now. Can you imagine how boring our nail polish blogs would be if we didn't have all these awesome indie brands to look at, we would get pretty sick of seeing the same main stream brands everywhere. 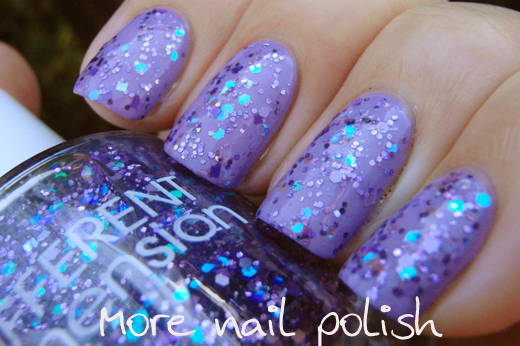 That is so fetch looks uh-mazing over the purple polish!